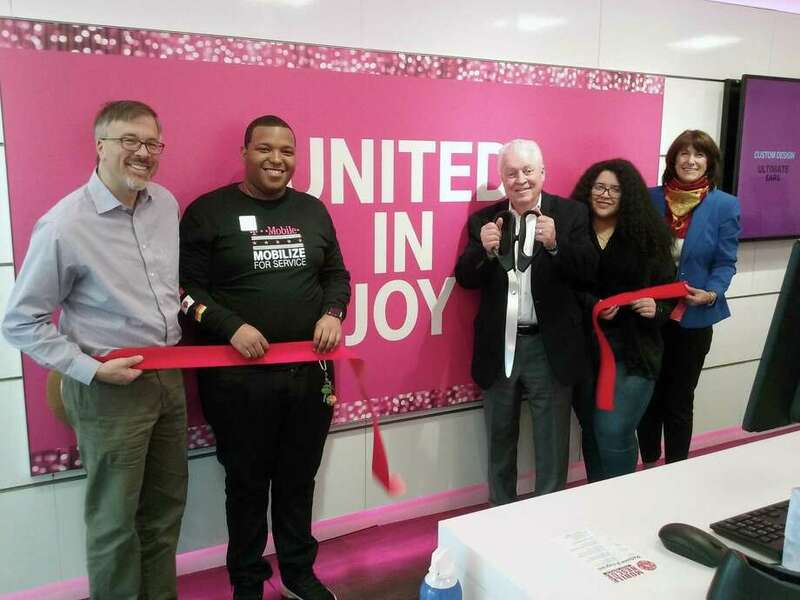 A ribbon-cutting ceremony for the new T-Mobile store at 525 Tunxis Hill Cut-Off in Fairfield was held on Nov. 16. From left, Community & Economic Development Director Mark Barnhart, mobile expert Richard Carberry, First Selectman Michael Tetreau, mobile expert Maria Rivera and Fairfield Chamber of Commerce President Beverly Balaz. Jillian Rose, a Fairfield resident, has received the Distinguished Educator Award from the Association of Rheumatology Health Professionals. Rose, director of community engagement, diversity and research at the Hospital for Special Surgery in New York City, received the honor at the annual meeting of the American College of Rheumatology in Chicago on Oct. 20. The award honors an ARHP member “who has demonstrated sustained excellence in the teaching of patients and students/trainees, including health professional students, medical students, residents, graduate students, and/or fellows, with their primary focus being rheumatology-related content,” according to the association. Rose, who began her career at Hospital for Special Surgery in 2005, is recognized by her colleagues as an innovative thought leader, talented educator and compassionate individual. She dedicates much of her work to understanding inequalities in rheumatology care and addressing them through educational programs for health professionals, as well as patients, to promote the highest quality of care. Rose has developed and implemented hospitalwide training for staff on working with multicultural populations and fostering an inclusive environment for the LGBTQ community. She chairs the LGBTQ Committee at HSS, providing ongoing leadership and support for the collection of data regarding gender identity, sexual orientation and race, ethnicity and preferred language. Rose earned a Master of Science degree from Columbia University School of Social Work in 2005, a master’s degree in public health from George Washington University in 2015, and is currently a PhD. candidate in public health at Columbia University. Mark P. Finlay, of Mark P. Finlay Architects, was inducted into the New England Design Hall of Fame on Nov. 8 in Boston. Local to the beach neighborhood of Fairfield, he has been a committed and active member of the community since opening the doors to his firm in 1984. From beginnings at the revered firm of Kevin Roche & John Dinkeloo in the 1970s, Finlay’s career spans 50 years, filled with transformative designs and the development of an architectural and interior design firm that entered its 35th year this summer. His local projects include homes and public spaces around town. MPFA is also highly regarded in the world of golf clubhouse design, working with some of the most prestigious clubs around the country including the Alotian Club, Fisher’s Island Club, and Trinity Forest Golf Club, as well as local clubs like The Patterson Club and Connecticut Golf Club. Fairfield-based Save the Children and Bridgeport-based Connecticut Institute for Refugees and Immigrants will host “Forced From Home: An Intimate Discussion on the Global Refugee Crisis” on Nov. 29 at 6 p.m. at Grace Farms in New Canaan. This moderated conversation will explore the crisis from displacement to resettlement. The moderator will be Lucy Nalpathanchil host of WNPR’s “Where We Live.” Speakers include Claudia Connor, president and CEO of CIRI; Julia Finder, education in emergencies advisor for Save the Children; Alicia Kinsman, director and managing attorney for CIRI’s Immigration Legal Services; and Jessica Lenz, senior director of child protection for Save the Children. Panelists will address the “push factors” that force people to flee their home countries, protection and education of displaced children, and how resettlement and integration transforms and saves lives. Single tickets are $25; email IPGEvents@savechildren.org to purchase. The Fairfield Ludlowe High School Drama Club will perform two one-act Thornton Wilder plays — “The Long Christmas Dinner” & “Pullman Car Hiawatha” — on Nov. 30 at 8 p.m. and Dec. 1 at 2 and 8 p.m. in the school auditorium. In preparation for the plays, students had the opportunity to Skype with Tappan Wilder, the nephew of Thornton Wilder and literary manager for the Wilder estate. Experimenting with a minimalist theatrical style, “The Long Christmas Dinner” covers 90 years of dinners in one home in less than an hour. In “Pullman Car Hiawatha” lives pass as they journey on a train, separate but equal, with each passenger facing life’s daily struggles. Tickets are $10 at the door. For information or to make reservations, contact fkondziela@fairfieldschools.org. First Congregational Church in Fairfield will host the Three Kings Bazaar on Nov. 30 from 5:30 to 8:30 p.m., and Dec. 1 from 10 a.m. to 3 p.m. This year features favorites like Mrs. Claus’s Attic, craft tables, The Store’s Christmas offerings, bake sale treats, and book sale. For auction will be a night on the town with two tickets to see “Beautiful: The Carole King Musical,” plus dinner and overnight accomodations. On Friday night, join the carol sing, and hot dogs and cocoa. On Saturday, enjoy a turkey sandwich feast.